-Doesn't have great height for the wing yet (around 6-5) but is extremely long with a near 7-foot wingspan, which allows him to play bigger than his size. -Shoots a rainbow jumper that still lacks great consistency at the moment. Outlook: One of the most improved players at the Camp compared to last year. Father played at Mississippi State. Solomon Hill-esqe small forward who can slide to the power forward spot in certain situations. USA Basketball staff members rave about his intangibles and work ethic, which is a great sign for his future. 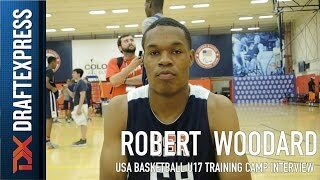 One of the youngest players in attendance, having just recently turned 15, Robert Woodard showed a very nice feel for the game and outside shooting stroke to compliment his excellent measurements for a wing player, at 6-4 ½ without shoes, with a 6-11 ½ wingspan and 207 pound frame.